Furthermore, this same CREDO study showed that once students have been in charter schools for three years or more, they do outperform their regular public school peers, as this graph from the report shows. Furthermore, a recent supplement to the first CREDO study, which examined charter schools in New York City, found that students in that city's charter schools definitely performed better than regular public school students. Finally, charter schools in Boston were recently examined. This report also used the high quality random sampling approach used by Hoxby. Once again, the performance findings strongly favored charter schools. In fact, the middle school charter school advantage in Boston was found to be truly remarkable, and it grew strong for each additional year that a Boston child was in one of the city's charter schools, as this next graph from the report shows. There are currently no charters schools in Kentucky. Two bills (HB 63) (HB 21) have been pre-filed for the 2010 legislative session that would introduce charter legislation. Rep. Brad Montell and Rep. Stan Lee are responsible for introducing the prefiled legislation. Charter schools have only been in existence in the United States for about 20 years. 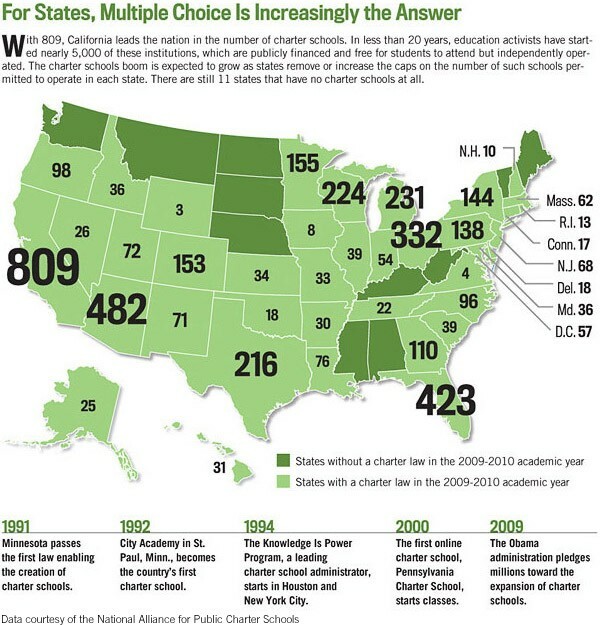 Yet more than 5,000 charters are now operating in 41 states. California, Arizona, Florida, Ohio, Michigan, Wisconsin and Texas all had more than 200 charter schools operating in their states during the 2009-10 school year. Check out this map on education researcher Jay Greene's blog to find the number of charters in your state. You will notice there are none in Kentucky while neighboring Ohio has 332 during the 2009-10 school year. Texas’ black students increased their math scores by 23 points – more than twice the progress of Kentucky’s blacks -- all during an era of dramatic enrollment increase at charter schools. When will Kentucky lawmakers who claim to care about minorities act to bring a taste of Texas to Kentucky by adding charter schools to the commonwealth’s educational tool chest? Separating fact from fiction: Are school-based councils (SBDM) suitable substitutes for charter schools?